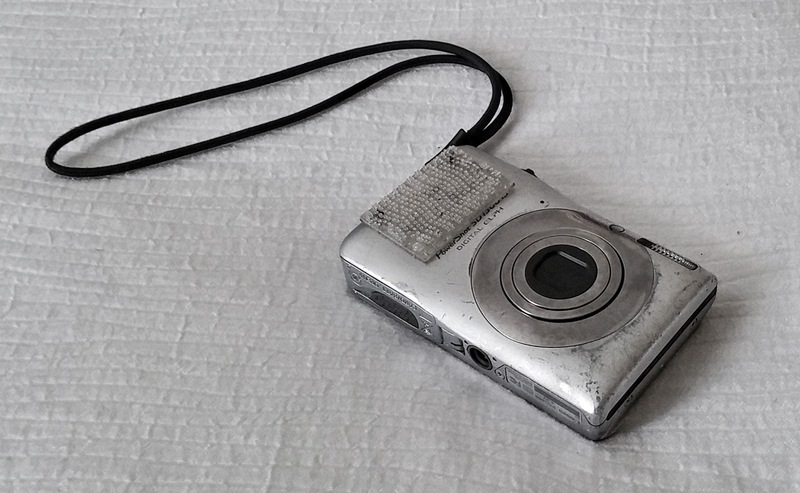 Some sad news to report, my camera died a few days ago. The lens won't push out on power up anymore. I can hear the motor trying to push the lens out, but it just clicks and grinds now, and then goes through an auto-shut down. Well, it was a good camera. Took thousands of photos for me on many rides. Didn't even complain when it rained. I can recall down pours in Canada, numerous drops on the pavement, getting cooked to 140 degrees sitting under direct sun, and even getting snowed on along Wolf Creek Pass. I put a strip of velcro on the side so that I could mount it on my gas tank, and quickly shoot a photo. I've been pulling it and out of my pocket so often, that its LCD monitor was too scratched up to view. I was on my way back from Alaska in June 2010, riding south along the ALCAN, trying to get photos as I rode down the highway. It was raining quite hard, but I really wanted to capture the riding conditions, the rain, the frost heaves, and the landscape. And the camera I had back then, simply quit. 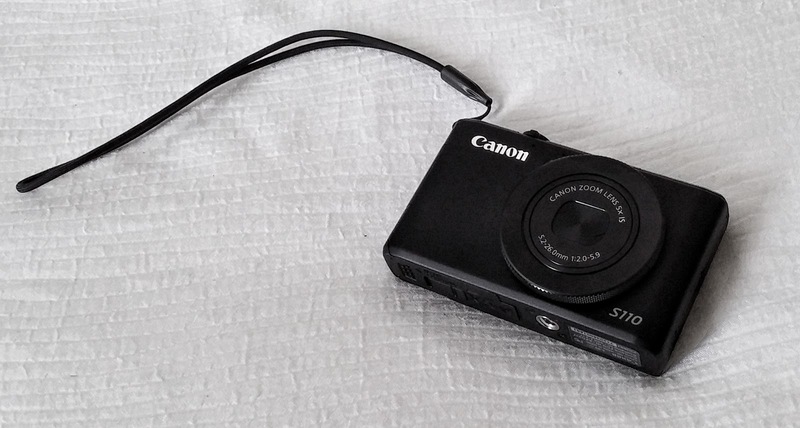 When I pulled into Whitehorse, Yukon, I found a Wal-Mart, and picked up this Canon Powershot SD1300 IS. It was on sale for $79.00. I didn't have room to keep the box, CD-ROM and manual that came with it, so I chucked them, keeping only camera and batter charger. In fact, just a week after I bought it, it developed a burn spot on its sensor, probably from taking a photo of the sun somewhere. As a result, photos of the sky, or something white, revealed a slightly darker blotch in the middle. Since buying it in Whitehorse, it's taken tens of thousands of photos for me. Perhaps 90% of the photos appearing on Motorcycle Philosophy and Road Pickle were taken from this camera. The other 10% came from my cellphone, or Sash's camera. I just couldn't get myself to toss it in the trash. So, I'm FedExing it to Sash's nephew Zack in Southern California. He's has a fondness for gadgets, as well as the time to tinker with them. Maybe he can fix it and give a second chance at life. So the camera I bought a couple days ago to replace it is a Canon S110. It has a 1/1.7 CMOS sensor, which is a little bit larger than the 1/2.3 used in most of the other Canon compacts. As a result, the price tag goes up quite a bit too. But I wanted to try something different. The biggest downside I see to this S110 is that the power-on button is really tiny. I'd have to ride bare-handed to use this camera. But as far as my Powershot SD1300 is concerned, it ought to feel as if it had a good life. It got to travel all over the United States, see some pretty amazing places, and be an important part of a small marketing business. "This is the kind of mentality that goes into hoarders", I told Sash, not wanting to part with my camera. But I don't want my lifestyle to become dragged down holding on to every piece of stuff I've purchased over the years. When I buy a new camera, I want it to understand that it's going to live like a gladiator, getting all the glory while it's alive, but getting tossed into the trash when it dies. That's the price it pays for an adventure of a lifetime. Otherwise, it should raise its hand up and refuse to be purchased, opting to wait for a grandma who will use it only for Christmases and graduations. So, I don't know. Maybe I shouldn't send it to Zack. Maybe he'll just give it some attention and set it aside forever where it can feel sad about current state of affairs. Maybe it's better to let it sit in a landfill and slowly rust over and get picked at by seagulls until its soul finally withers away. It's sad to think that the entire camera is useless because of one small part. But that's a fact of the consumerist/disposable world we live in. It's the kind of thing that makes you wish you could just disintegrate something, store the molecular pattern in a ZIP file, and reassemble it anytime from a pile of garbage. Glue a little plastic circle on your "ON" button. Perhaps cut the end of an pencil eraser and shape it to fit, then super glue it. or perhaps half of a plastic BB (pellet). I noticed some Canon S110s for sale up here too. You sure got a lot of use for that $79. I think your old camera had a full and adventurous life. I am sure the new one will have just as much fun. I'm not telling how many of our old broken digital cameras hubby has hanging around. More than we have working ones I think.